The importance of proper oral health remains a necessity for patients of every age. From the moment your first tooth erupts until you are old enough to consider dentures, you should be receiving dental care regularly. At Infinity Dental, Dr. Sushil Patel and his compassionate team treat patients of all ages with the goal of helping them achieve lasting oral health. We’ll work with you and your family to get you the care you need. When you consult with our team, you’ll learn which treatments are the most beneficial for your age that help prevent against complications in the future. To get started on personalized treatment for you or members of your family, contact our Apopka dental office! Family dentistry involves personalized dental services provided by a dentist who treats the entire family — as opposed to just adults or kids. Your child can keep the same dentist throughout their life— even in their senior years. Family Dentistry vs. General Dentistry: What is the Difference? The difference is that family dentistry is uniquely tailored to deal with the age-specific oral health and beauty needs of patients of all ages – from the youngest to oldest members of the household. Family dental care is designed to help educate patients young and old about the importance of their smile’s health by helping them practice proper oral hygiene at home. If you have young children, you may be wondering when you should schedule their first dental exam. We recommend bringing your child in for a visit when they develop their first tooth. Although starting their oral health journey as early as possible is vital for your child, their first visit is generally designed to help them become comfortable at our dental office. They will meet our team during their appointment, tour the office, and receive a gentle cleaning and exam. 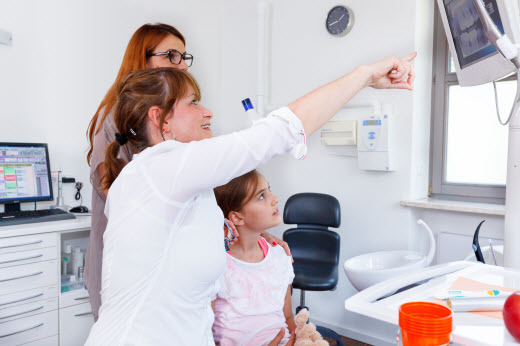 It can be particularly difficult for families with small children to find the right family-friendly dentist. We do everything we can at Infinity Dental to make dental check-ups positive, welcoming and relaxing for kids. For particularly anxious children, we do offer dental sedation options that can be tailored to fit their specific needs. Is Professional Dental Care Needed at Every Age? Definitely! We're living lives that are hectic. The average American household engages in countless activities on any given day, such as sports, deciding what to cook or pick up for dinner, dance lessons, carpools, and much more. These factors can also lead to family members and individuals lacking in their everyday oral and dental hygiene. With dental concerns and care changing with age, it can make it that much more challenging to keep smiles healthy. 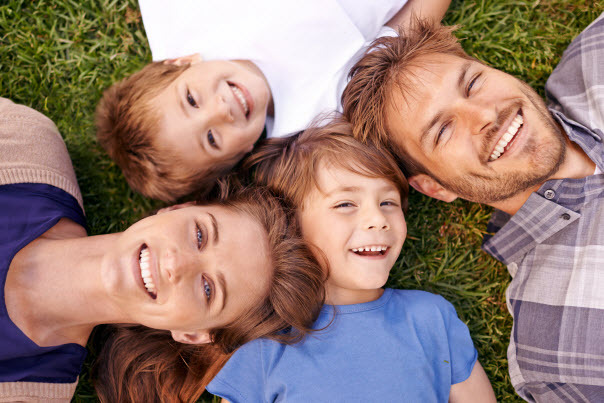 Family dental care is a necessity to ensure good oral health for busy families and individuals. Rather than having two or three separate appointments at different locations, all your family’s dental appointments can be performed at our office! While most babies don't start getting teeth until they’re about six months old, dental care is important from the very beginning. Before your child's first birthday, many dentists recommend an initial visit to ensure proper care and cleaning of teeth and gums. It's a good idea to get used to cleaning the gums of your baby soon after birth. Even though they may be a little bit fussy at first, your young one will eventually get used to having their mouth cleaned like other parts of the body. When you begin early on the path of proactive dental care, many children grow up to enjoy brushing their teeth and taking care of their smile. It's extremely important to take good care of your child's baby teeth. Yes, they eventually fall out, but baby teeth play a key role in helping your child bite, chew food, and speak properly. Teaching proper oral care to your child at a young age is a lifelong investment in both oral and overall health. You can start by setting an example. Taking good care of your teeth sends a message that your child needs to be aware of the value of their oral health. And anything that makes dental care fun like brushing with your child or allowing them to pick their toothbrush helps keep them interested in proper oral care. When your child visits us for essential dental care, many of the same treatment and assessment options that adults have are available to children. These include X - rays, dental sealants, orthodontics, and more. Teens often face a unique set of challenges that are not faced by younger kids. Braces, third molars, facial appearance, and bad breath are just a few new things your adolescents typically worry about as they make the transition to adulthood. With regular visits to the dentist, proper oral hygiene, eating a nutritional diet, and taking care of their clear aligners, mouth-guards and other orthodontic appliances, your teen is doing their part in working with our team to ensure they achieve healthy smiles into adulthood. As an adult, you are not immune to dental problems. In addition to maintaining a good home care routine, the best thing you can do is schedule regular dental check-ups every six months for professional cleanings. Besides making sure your teeth, gums and other important oral structures are healthy; there is a wide range of cosmetic-focused options available to help your smile look and feel its best. These can range from clear orthodontic aligners to whitening teeth and life-dental restorations such as veneers. As we all grow older, some health concerns are gaining our full attention, particularly the importance of oral health for seniors. Most seniors in today's world can proudly say they have all or nearly all their remaining natural teeth. This is made possible by a lifetime of proactive oral hygiene and regular dental visits for cleaning, examinations, oral cancer screening, and other preventive measures. However, certain dental conditions, such as gum disease, tooth decay, weak or worn enamel, and oral cancer, may negatively affect your smile with age. It's crucial to keep your dental visits and oral hygiene at home diligent. We offer comprehensive restorative services such as dental implants, dentures, crowns, bridges, partials, and much more to help senior patients enjoy healthy smiles in their golden years. A dental check-up every six months is recommended, with more frequent visits if you have gum disease. During your routine examination, your dentist or dental hygienist will look for signs of decay and remove plaque buildup that you cannot brush or floss away. When searching for a new family dentist in the Apopka area, there are so many options available that your decision may become a little overwhelming. However, it is crucial to ensure that you entrust a quality dental care provider with the experience to treat the oral health needs of your entire family. Evaluate the dentist’s training: Find out if the dentist regularly takes continuing education classes to stay up-to-date on the latest treatments and field techniques. Make sure you select a family-friendly dentist who has prioritized ongoing training. Look for a dentist with a broad range of experience: A family dentist must address the unique needs of patients of all ages. Make sure that your dentist has the necessary expertise to treat just about any condition that could affect every member of your family — from your young children to your elderly relatives. Choose a dentist that offers comprehensive services: General dentistry services include most of the treatments you'll need, but you want to make sure your family dentist can address other needs that may arise throughout your life. A dentist who offers cosmetic dentistry services to improve your smile's appearance, sedation dentistry services to make you feel relaxed and comfortable during treatments and orthodontics to straighten your teenage children's teeth will enable you to receive all your treatments in one place. Choose a dental practice with a warm, inviting atmosphere: If you have young children, this is particularly important. Your family dentist will be the person who provides their dental training experiences to your children. Choosing a practice that creates a positive environment for kids and instills good oral hygiene habits will pay huge bonuses throughout their lives. Look at reviews and testimonials for your potential family dentist: Don’t just talk to the dentist. See what other patients have to say about the practice, team, and doctor. Online reviews and testimonials can provide the additional feedback needed to help you make a confident decision. Helping you and your family reach your dental goals is a priority for the entire team at Infinity Dental. If you are looking for compassionate and thorough care for all members of your family, give us a call today! We look forward to meeting you and exceeding your expectations!